A leaked log of a WikiLeaks chat conducted in Twitter DMs, independently verified, reveals that WikiLeaks thought Julian Assange would personally benefit from Trump being in office. Portions of the log, which covers a period of several years, were previously discussed by Coura Currier and Micah Lee at The Intercept, including WikiLeak’s apparent strategic preference for the GOP. Buried in a much later portion of the chat, following the election, is the revelation that WikiLeaks expected that Trump’s presidency would help the case against Assange go away. The log was verified by The Intercept by logging into the account and viewing the chats first hand. SHA512 hashes confirmed that the logs were the same. While the decision to conduct such a chat in an insecure channel is somewhat questionable, the group seem to have considered it a step up from a previous group chat. The group considered Twitter’s privacy rules enough to make the chat “semi-protected” as compared to IRC. Whatever security and privacy the group expected in the chat, it led to numerous candid and revealing moments. WikiLeaks’ statement came less than a week after Manning’s release, and even less time since Sweden had dropped the case against Assange. Assange had previously offered to agree to go to the United States if Manning were released. When Manning was released, Assange backed out of the offer. The leaked chat also reveals that when Assange made the offer, WikiLeaks expected that Obama would ignore her name when it was placed on the list of names of candidates for commutation. Leaked #WikiLeaks chat reveals that when #Assange promised to agree to extradition if @xychelsea‘s sentence was commuted, he thought there was no chance it’d happen. The statement adds additional seriousness to a message WikiLeaks had sent to Donald Trump Jr. several months before. 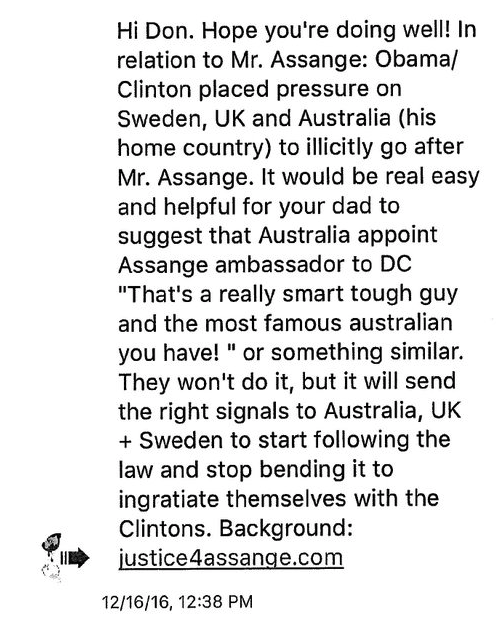 After Trump’s election but prior to his inauguration, WikiLeaks proposed that Trump “suggest that Australia appoint Assange ambassador to D.C. … They won’t do it, but it will send the right signals.” WikiLeaks’ proposal began and ended by framing the case against Assange as the work of President Obama and Hillary Clinton. It’s unclear from the messages whether WikiLeaks was playing to Trump’s infamous opposition to seemingly everything he associated with either Obama and Hillary Clinton, or if WikiLeaks not only believed that Trump might help Assange, but that Clinton had been (and would have continued to be, had she won the election) the architect of his pain. Several individuals who have worked or spoken with Assange, and who spoke on the condition of anonymity, have related that the electoral defeat of Hillary Clinton was something that he had worked for and that he saw Trump’s election as the beginning of a new phase. These statements have since been corroborated by the Department of Justice, which filed an indictment revealing that WikiLeaks sent Guccifer 2 (the front that acted as the source of the hacked emails) a message on June 22 instructing them to send new hacked DNC materials to them, citing a bigger impact. WikiLeaks later made a similar comment to the author, requesting exclusive access to the Guccifer 2 cache. On July 6th, WikiLeaks sent another message specifically requesting Hillary-related information in time for the Democratic National Convention. The explicit reason for this, according to WikiLeaks, was that they thought Trump had “only a 25% chance of winning against Hillary . . . so conflict between Bernie and Hillary is interesting.” Pieced together, the leaked chat and the indictment seem to paint a picture of both motive, intent, and execution in not only Clinton’s loss, but the Republicans’ victory – in this case, Trump’s.